Surveyor General Office Rawalpindi Department has announced the jobs 2019 and invited the applications form the candidates who are eligible and interested to get these jobs 2019. 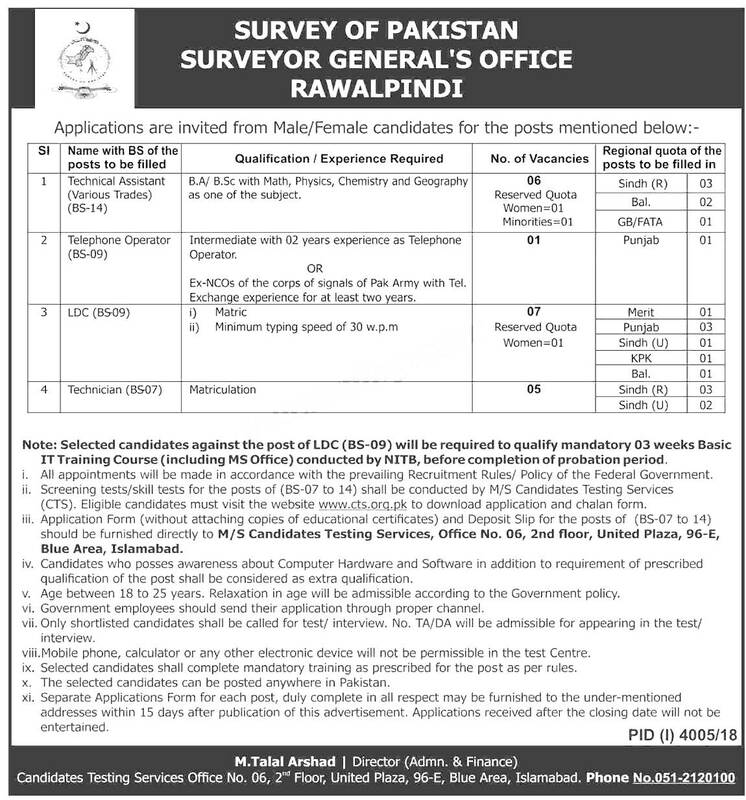 Surveyor General Office Department Rawalpindi assigned the CTS testing service to conduct the written test for these recruitment. Test Application Form Candidates List will be updated here if you are interested the you must download the application form and then apply to cts testing service for these jobs. Applications are invited from Male/Female candidates for the posts mentioned below. All appointments will be made in accordance with the prevailing Recruitment Rules/ Policy of the Federal Government. Screening tests/skill tests for the posts of (BS-07 to 14) shall be conducted by M/S Candidates Testing Services (CTS). Eligible candidates must visit the website cts.orq.pk to download application and chalan form. Application Form (without attaching copies of educational certificates) and Deposit Slip for the posts of (85-07 to 14) should be furnished directly to M/S Candidates Testing Services, Office No. 06, 2nd floor, United Plaza, 96-E, Blue Area, Islamabad. Selected candidates against the post of LDC (BS-09) will be required to qualify mandatory 03 weeks Basic IT Training Course (including MS Office) conducted by NITB, before completion of probation period. Candidates who posses awareness about Computer Hardware and Software in addition to requirement of prescribed qualification of the post shall be considered as extra qualification. Age between 18 to 25 years. Relaxation in age will be admissible according to the Government policy. Government employees should send their application through proper channel. Only shortlisted candidates shall be called for test/ interview. No. TA/DA will be admissible for appearing in the test. Mobile phone, calculator or any other electronic device will not be permissible in the test Centre. Selected candidates shall complete mandatory training as prescribed for the post as per rules. The selected candidates can be posted anywhere in Pakistan. Separate Applications Form for each post, duly complete in all respect may be furnished to the under-mentioned addresses within 15 days after publication of this advertisement.